In a show of approval for Quick Step riders Dries Devenyns, Kristof Vandewalle and Guillaume Van Keirsbulck, the Belgian team has announced that it intends to retain the riders until the end of 2013. The trio will remain with the team for two and a half more seasons, working alongside Tom Boonen and others in the squad. Vandewalle is 26 years old and this year finished a solid 19th in Liège-Bastogne-Liège. 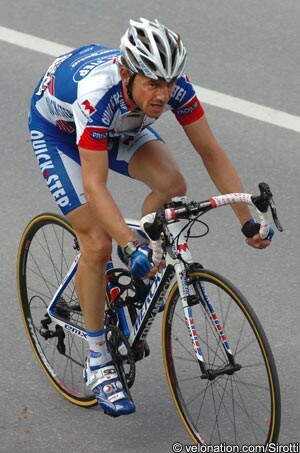 He was best-placed of the team’s riders there. Devenyns is a year older and previously won the Belgian Under 23 title; earlier this year, he was sixth in Brabantse Pijl. Van Keirsbulk is the youngest of the trio, and is one of the most promising young Belgian riders. The first year pro is just 20 years of age and won the junior Paris-Roubaix race in 2009. He’s the grandson of Benoni Beheyt, who famously outsprinted Rik Van Looy to win the 1963 world pro championship, and who won a stage of the Tour de France the following season. Team captain Tom Boonen recently confirmed that he would extend with the team. His new deal also takes him to the end of 2013, and he has an option to extent that by a season. He and new French champion Sylvain Chavanel will lead the team in the Tour de France. Devenyns will also take part.